Was Sepilok orangutan’s release a success? Below is our full response to news of the release of one of Sepilok Orangutan Rehabilitation Centre’s (SORC) orangutans, called Tiger. The release took place on 3 October 2018. Tiger’s release was widely covered by major news medias in Malaysia. Here is one of them. Tiger is now back at SORC. LAST October, an orangutan called Tiger was moved from the Sepilok Orangutan Rehabilitation Centre (SORC) to the Tabin Wildlife Reserve. Tiger’s transfer to Tabin, which was reportedly co-funded by the Malaysian Palm Oil Council, was labelled as his “journey to freedom” and return to “the wild” by the Sabah Wildlife Department (SWD). A British figure influential in Sabah claimed that “another magnificent orangutan is saved”. Several major media outlets published news of the transfer and release. However, we would like to question whether Tiger’s release into Tabin was a success for orangutan conservation in Sabah, especially since Tiger was relocated back to SORC in December. There appears to be no mention in the media of Tiger’s return to SORC, unlike the fanfare by SWD when he was released into Tabin. Did SWD decide not to inform the press yet to avoid causing public relations embarrassment to Sabah? We have tried to make this letter as easy as possible for the public to understand and they can make up their mind after reading this. When rehabilitant orangutans are released into a forest, there needs to be “post-release monitoring” (PRM). It is a challenging yet crucial part of orangutan conservation as after release, researchers will track an orangutan to ensure it is able to adapt and survive in a new forest area. It also enables intervention if the orangutan is proven to be unable to adapt or even needs medical attention. Therefore, PRM is also important for welfare reasons. A top SWD officer said attempts would be made to monitor Tiger upon release, yet we were informed that there was no PRM done. If this is untrue, we invite the SWD to release Tiger’s PRM details. The International Union for Conservation of Nature (IUCN) also recommends that PRM data be made public. Tiger, reported to be 19 years old, is a fully matured flanged male. In a forest, flanged, dominant orangutan males establish their territory and generally stay within it their entire lives. Introducing Tiger into a jungle virtually alien to him could have led to brutal physical conflicts with other resident, dominant orangutan males, and as Tiger has been at SORC for more than 15 years, he may not have the survival/feral attributes of a totally wild dominant orangutan male. This affects his ability to defend and establish himself in his new home. Moving Tiger into Tabin could have also disrupted the native resident orangutan population. SWD claimed that Tiger was doing well at SORC and were confident that he would forage well in Tabin. However, this can only be confirmed through persistent PRM, which can take months to complete. SORC is inundated with unsustainable tourism practices till this day (the public will know more about this soon) and human habituation could affect an orangutan’s ability to adapt upon release. We have also been informed in the past that Tiger had spent considerable amount of time in cages at SORC. Based on the above, would it be a surprise to anyone that Tiger was relocated back to SORC? We were informed that, in short, Tiger became a danger to people and himself and SWD had no choice but locate and transfer him back to SORC before things got out of hand. Why was Tiger sent to Tabin? Releasing a 19-year-old flanged male so he may “go back into the wild” is unheard of in the area of orangutan rehabilitation. Inform a well-meaning orangutan conservationist that a 19-year-old flanged male is going to be “wild released” to a new forest area and immediately there will be a number of concerns raised. SWD claim that the forest adjacent to SORC is too small for Tiger and thought he would “survive better in the wild”. Or does the real problem lie in the fact there are already dominant males around SORC and SWD wanted to avoid more PR disasters, especially after a tourist was attacked there by a “problem” orangutan two years ago? Several Malaysian conservationists have expressed their opinion to us and allege that SWD was merely getting rid of an orangutan now too big and dangerous to handle. There are other male orangutans around SORC and they are reported to be a risk to tourism activity at the centre. These males are growing larger and stronger and will cause bigger issues once they hit puberty. While females continue to reproduce. Going back to the subject of PRM, it is a gruelling task to trail an adult orangutan male as he travels far and wide in the wild. However, if there is no PRM made and lack of information on Tiger’s survivability after release, this orangutan’s move to Tabin in October cannot be called a conservation success. Instead it now looks like it was an embarrassing failure. This is a public relations practice by the SWD, which has shown no interest in transparency in our private communications with it, despite a new government. The SWD knew what it was doing and thus could be accused of deliberately misleading Malaysians on what orangutan conservation really looks like. This greenwashing needs to stop and we urge the public to demand the SWD to be transparent on Tiger’s future. On May 10th the Malaysian environment ministry announced that Lasah will remain at the Langkawi Elephant Adventures [LEA] after an evaluation. In a publication by a government owned news agency [re-published by The Sun Malaysia] the ministry claimed that Lasah is in a “healthy condition” based on checks by the Wildlife and National Parks Department (Perhilitan) and the Malaysian Association of Zoological Parks and Aquaria (Mazpa). Mazpa has previously said that elephant rides provides Lasah with exercise, an excuse while ignoring the fact that elephants used in rides are abused. – Our concerns regarding Lasah’s health, use and abuse has never been addressed to us, including in the article above. – In March, eight months after the campaign for Lasah started, the environment ministry finally said that “only two of Lasah’s legs are tied” [when not exploited for tourist money] and called it normal practice. – The ministry and LEA claim the latter abides by the law. However our emails to the former regarding Lasah’s [daily] chaining relating to Malaysian wildife laws were never responded. 3. Donate, please help us keep our campaign going. Click on the donate button on the right of this page. Any amount will be of help. After several months of trying we have today been granted an audience with the environment minister of Malaysia, which will take place tomorrow, 1st March. Could you please help us tweet to the environment ministry to let them know you continue to demand for Lasah’s freedom? Simply click on the link below to tweet now! Thank you to those who have recently written to the environment minister, we appreciate it. Updates on our meeting with the minister and others will be posted soon. In the meantime please check this link to know what else you can do for Lasah. We now only need just under 1,400 signatures to reach the 400,000 signature mark. Will you please help share this petition on your social media outlets like Facebook and Twitter? Thank you for your kind, persistent support. With you, we have campaigned for Lasah for seven months now and we won’t give up. Note to supporters: It seems that we might only be able to send out five updates through a Care2.com petition and we have just made our 5th update on the Care2.com petition for Lasah. Therefore, we suggest you sign the other petition for Lasah at Change.org as there are no limits to sending out updates on Change.org petitions. After signing the Change.org petition for Lasah you will automatically receive future updates into your email. We apologize for any inconvenience. Thank you for helping us reach 389,450 signatures. We hope you will share the Care2 petition so we may reach 400,000 soon. 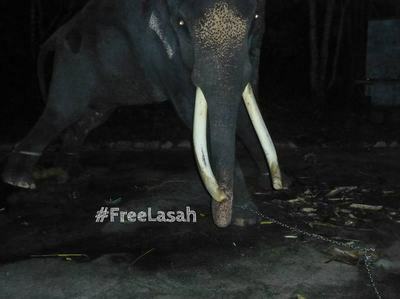 We appreciate your persistent support for the campaign to #FreeLasah from his daily misery at the Langkawi Elephant Adventures [LEA] on the holiday island of Langkawi, north of Malaysia. We recently submitted this petition and the one at Change.org to the Malaysian prime minister’s office. We will submit both petitions to the Malaysian wildlife department this week. In the meantime we are still making efforts to secure a meeting with the Malaysian Environment Minister to submit the petitions personally and to ask the minister to get Lasah transferred to the elephant sanctuary here. To date 649 supporters like yourself have written to the Environment Ministry Malaysia to demand that Lasah be freed. Thank you very much! If you haven’t written please help keep the pressure up by writing today. Click here for details. Follow FOTO Malaysia on Twitter today and please help us retweet our tweets to #FreeLasah. Since our campaign for Lasah started we have persistently asked the government, through the Environment Ministry [NRE], [the wildlife department and prime minister’s department are also copied] to urgently transfer Lasah to the Kuala Gandah Elephant Sanctuary. And we will continue to do so. The Asia for Animals coalition continues to support this campaign and have shared latest details regarding this in their November newsletter. Thank you for your support which we truly appreciate. If most of the email addresses below fail/bounce please re-send the same email to all the email addresses. If some fail/bounce, no worries! It would be great if you could also CC emails of the Malaysian embassy in the country you live. Emails can be obtained from this link. You may use this email draft below if you wish. Please feel free to make changes. The Langkawi Elephant Adventures on Langkawi island has held the elephant Lasah under deplorable conditions for ten years and used him for elephant rides. Investigators also found Lasah kept in brutal conditions behind public eyes, chained on all four legs. Is Lasah chained in this cruel manner during LEA’s closing hours? This is devastating for a social animal like Lasah and his treatment is unacceptable. Lasah has spent over 20 years in several zoos, forced to work in a logging camp, perform in shows including in a popular Malaysian entertainment outlet and used in commercials and films. Lasah has endured a lonely life of exploitation at the Langkawi Elephant Adventures and other places long enough. Over 370,000 supporters around the world have spoken up for Lasah through the Care2.com petition at this link http://tinyurl.com/freelasah3. It is disgraceful what this elephant has endured all these years. It is time the Malaysian government put an end to Lasah’s suffering. I join FOTO Malaysia and other animal lovers like myself from around the world in asking you to please order the transfer of Lasah to the Kuala Gandah elephant sanctuary where he will have the companionship of other elephants, space, and care that he deserves for the rest of his life. A state project consisting in building a paved road and a bridge in the Kinabatangan region in accordance with the Sabah Development Corridor’s plan (SDC) launched in January 2008, one of the economic corridors initiated under the 9th Malaysia Plan – and approved under the 11th Malaysia Plan – has been a center of a lot of attention and concerns by local organizations and researchers since January this year. At the moment, the project comprises a 240 m long bridge expected to connect the western river bank to the Sukau village on the East and a road which would connect Sukau to Litang and Tomanggong, over 40 km away to the South-East. A 1000 m long viaduct would be included to the project across elephant habitat. The SDC plan states this project is to stimulate local economic activities and ensure the sustainable management of the state’s resources. Any of the different options proposed for the project at the moment will worsen the forest fragmentation, which is already bad in the area. A lot of forests have been converted to oil palm plantations or other form of development since the last decade. Researchers raised their concerns on the impacts the project would generate on the elephant populations and the threat to their survival. He said that the elephants wouldn’t go under the bridge because of the vibrations and noise which would result in splitting elephant herds in Sukau with those in Lokan and Tangkulap. Orangutans are also found in the Lower Kinabatangan region at a quite high density. There would be 700 to 825 orangutans in the Lower Kinabatangan floodplain. As for the pygmy elephants, the project would go against the Lower Kinabatangan’s forests site-based priority action from the State’s Orangutan Action Plan which stipulates that efforts should be focused on preventing “any process that would further fragment the orangutan habitat (highways, bridges etc)”. On the other hand several local communities in Sukau and surrounding villages are pushing for the project. They say they need it to facilitate the access to Sandakan or Lahad Datu for public healthcare services in a more secure and fastest way than presently. Broadly this bridge and the connected road would meet the villagers’ needs for development and improve their general living conditions. It wouldn’t be in anyone’s interest to block the people from improving their livelihood especially when it comes to healthcare. But it shouldn’t be at the expense of wildlife survival and remaining forests. The issue is very sensitive as a protest was organized by some villagers from Sukau an around on March 6th in kampung Sukau, to push the project to start and to show their objections to the NGOs for going against the project, thus causing the needed development to be postponed. We hope and will push for an alternative solution to be discussed, a solution that minimizes the impacts on wildlife and forests and still allows the people to conveniently have access to healthcare and to meet their needs as much as possible. Foto will post updates as soon as we hear any on our Facebook page and website. 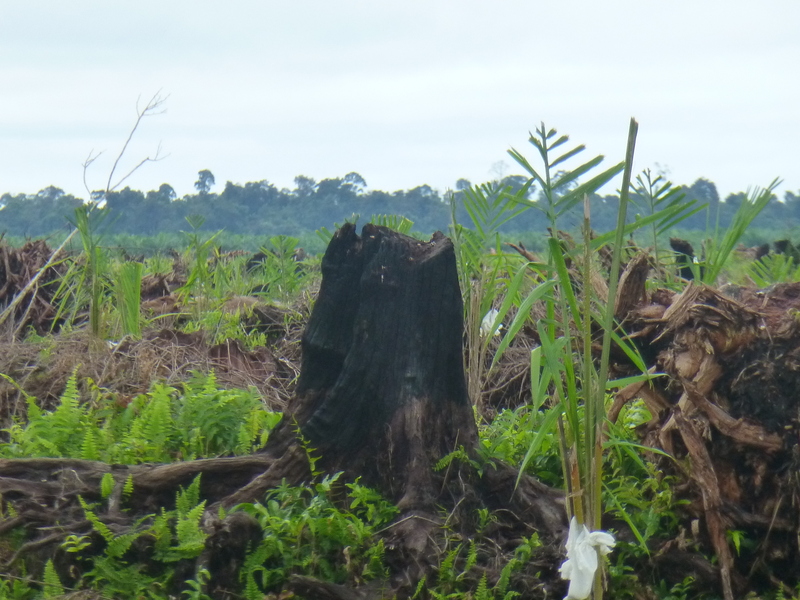 On 25th February Sarawak Report published our press statement regarding BLD Plantation’s continued destruction of peat forests near Sibu, in the Malaysian Borneo state of Sarawak. Below is the full statement. Link to the statement on Sarawak Report’s website can be found here. After Bunge Limited, one of the world’s largest agribusiness companies, announced last year its suspension of new commercial activity with Malaysian palm oil company BLD Plantation Bhd, BLD’s trading partner Apical Malaysia Sdn Bhd declared earlier this month they would be suspending trade with BLD until the latter addresses the issues brought up against them by Malaysian environmental NGO Friends of the Orangutans Malaysia (FOTO). This significant action comes after BLD’s peat destroying activities near Sibu violated American headquartered Bunge and Apical’s sustainability policies. According to FOTO other major companies in Asia, Europe and America sourcing and trading palm oil products have been alerted and the NGO’s ally Rainforest Foundation Norway have asked numerous companies if they are in business with BLD. At this date BLD continues to massively clear carbon-rich peat forests for oil palm agriculture which severely affects the environment and the local communities in BLD’s 20,446 hectares (ha) concession. “Since year 2000 the amount of peat forest lost in BLD’s Sibu concession has been well over 12,000 ha and before long there might not be any peat forests left in the concession”, attested Upreshpal Singh, FOTO’s Director. Clearing peat forest for agriculture, especially where it is very deep like in BLD’s concession, has disastrous consequences such as a massive release of carbon dioxide (from peat draining through canals), increased fire risk, and prolonged flooding which will eventually cause the land to be unproductive for agriculture, as has been highlighted in a study by Wetlands International in mid-2015. In addition to harming the environment BLD’s activities also impact the Iban and Melanau communities whose NCR lands overlap with the company’s concession. According to data provided by the Sarawak Dayak Iban Association (SADIA), the company’s Sibu concession covers about 47% (4,127 ha) of the Iban villagers’ NCR lands in kampung Tutus, one of the affected communities which will bring the case of land-grabbing by BLD to court, scheduled this month. It will not be the first lawsuit BLD will face for land-grabbing allegations by local communities. Kampung Tutus villagers interviewed by FOTO and SADIA late last year said that their livelihood has been severely affected in many ways by BLD. According to Upreshpal, FOTO repeatedly contacted the Sarawak chief minister’s office through email after a meeting held in early October 2015 with state premier Tan Sri Adenan Satem to discuss BLD’s transgressions. However, all of the NGO’s emails have been ignored as there appears to be no sign if the chief minister will intervene and stop BLD. The NGO also contacted banks which had been financing BLD, urging them to investigate their client as BLD’s activities violate sustainable financing commitments made by of several of its financiers. In early 2015 chief minister Adenan declared “We have enough of that already and we are not going to open up any more [palm oil] plantations”. BLD’s activities are in stark contrast to Tan Sri Adenan’s committment; however the chief minister does not show evidence of his intention to stop BLD from further destruction. “We are very disappointed we never received any reply from the chief minister’ office when Tan Sri Adenan claims to want to protect Sarawak’s forests. BLD’s unsustainable and destructive activities besmirch Malaysia’s reputation in regard to environment conservation and it looks like it is still business as usual in Sarawak”, concluded Upreshpal. After Bunge Limited, one of the world’s largest agribusiness companies, announced last year its suspension of new commercial activity with Malaysian palm oil company BLD Plantation Berhad, FOTO has been informed that Apical Malaysia Sdn Berhad declared in early February it will suspend trading with BLD as well until the latter addresses the issues brought up against them by FOTO and our allies. BLD are still extensively clearing peat swamp forest and land-grabbing local communities in Sarawak, in one of their concession located near Sibu despite our attempts to stop them. No competent authority seems willing to take action. BLD’s activities violate both Apical and Bunge’s sustainability policies. But they might not be the last to stop buying from BLD, Kirana (BLD’s wholly-owned refinery) or Sunfield Global (trading company buying from BLD)! FOTO and our allies have alerted a number of US and European companies about BLD’s unsustainable activities in Sibu and we will also email Asian companies – with which we suspect BLD is mostly dealing – in this regard very soon. One step at a time we will continue fighting to make BLD stop! In June last year Malaysian palm oil company BLD Plantation Berhad announced its plans to clear 14,000 ha of carbon-rich peatland in its Sibu’s concession in the next two years. Unless stopped, BLD Plantation will cause further serious environmental damages particularly on the climate, emitting vast amount of carbon dioxyde into the atmosphere in the process. The executive chairperson of BLD Plantation, Henry Lau Lee Kong, announced that the company had already started clearing activity to develop palm oil plantations, while existing 6,000 ha of palm oil plantations belonging to the company sits on peatland. Less than a week after the announcement US-based agricultural trader Bunge (RSPO member) suspended indefinitely any new commercial activity with Kirana Palm Oil Refinery Sdn. Bhd (Kirana), a wholly-owned subsidiary of BLD Plantation, after a formal complaint by American environmental group Forest Heroes. BLD Plantation is also a supplier to Kirana. Right now rampant peatland clearing is ongoing and the company is now focusing on the northern and center part of the concession while the southern part is already mostly cleared and planted with oil palms. Between 2001 and 2015 (BLD was given license to develop the concession in 2000), over 10,300 ha have been slashed by the company inside the concession. Over 10,300 ha of peat swamp forest that use to be utilized by the local communities for hunting, fishing and planting fruit trees are now gone forever. Cleared land using open burning in BLD’s concession. Young oil palms already planted. At the background stands peat forest that used to occur over all BLD’s concession area before they cleared it. At the end of August, FOTO contacted BLD Plantation asking them to stop further clearing activities and to adopt a strong and robust ‘No Deforestation, No Peat, No Exploitation’ policy which also covers BLD’s suppliers and subsidiaries and to resolve land grabbing complaints by the local communities. An equivalent area should also be restored to compensate the one already cleared. Until this day we are yet to hear from the company. Measurement of peat depth in the BLD concession. We recorded a depth of at least 5.2 meters. A meeting with the Sarawak chief minister Adenan Satem and his delegation has taken place on Thursday 1st of October gathering International organizations Rainforest Foundation Norway, the Union of Concerned Scientists, Center for International Policy, local group SADIA, environmental lawyer Harrison Ngau and Friends of the Orangutans. A formal request has been brought to the chief minister itself, who has previously banned any new conversion of forests into palm oil plantations, to push the company to stop deforesting. Despite the indisputable evidences of clearing and many attempts to ask the chief minister to stop BLD the company continues to destroy peat forests to plant palm oil. We have not received any reply to our emails to the chief minister’s office. 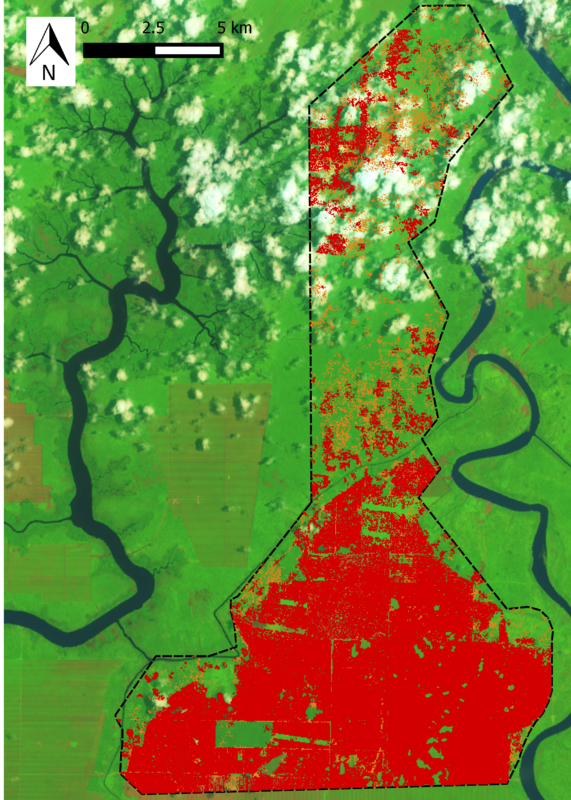 Furthermore local communities’ NCR (Native Customary Right) lands have been encroached by BLD while the peat swamp forests are trashed…that makes at least two really good reasons to make BLD stop the clearing! One case of land-grabbing by the company on the NCR lands of the Iban from Tutus will be brought to court in February 2016. FOTO is now focusing on targeting BLD’s financiers and customers. We contacted all the banks for which we have evidences they financed at some point BLD Plantation or one of its direct subsidiary to alert them of the ongoing illegal and unethical activities undertaken by their client and to ask them to promptly address this issue accordingly. We are in contact with Malaysian bank Maybank that we know provided BLD’s subsidiary with over RM 390 Million of loan. They might be BLD’s main banker. In the other hand, with help from Rainforest Foundation Norway we sent out letter to a listing of European and US companies that purchase palm oil products, therefore potential clients of BLD, asking them to review their supply-chain and if sourcing from BLD to stop any activity with them.